It seems that the combination of Facebook taking over WhatsApp for $19bn swiftly followed by the service crashing for several hours over the weekend has seen millions of users rushing into the open arms of rival messaging app, Telegram. 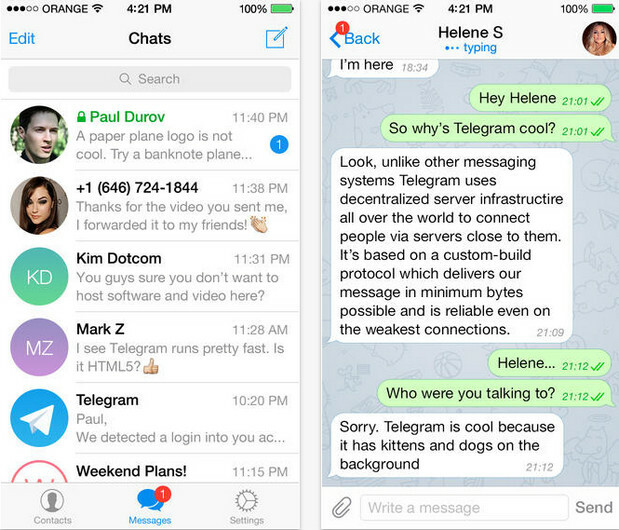 Launching in October 2013, Telegram is a near-identical replacement service of WhatsApp but promises to remain advert and subscription free forever, with much being made of its security features. “Telegram is not intended to bring revenue, it will never sell ads or accept outside investment. It also cannot be sold,” says the company in their online FAQ. Keen to show the world just how secure their encrypted messaging is, Telegram has thrown down the gauntlet to hackers, putting up a $200,000 bounty for anyone who can break their security. Telegram backer, Pavel Durov, will give $200,000 in BTC to the first person to breakTelegram’ encrypted protocol. Starting today, each day Paul (+79112317383) will be sending a message containing a secret email address to Nick (+79218944725). In order to prove that Telegram crypto was indeed deciphered and claim your prize, send an email to the secret email address from Paul’s message. – The entire text of the message that contained the secret email. – Your Bitcoin address to receive the $200,000 in BTC. – A detailed explanation of the attack. Encrypted Telegram traffic from and to Paul’s account is publicly available for download from this page. You can send Telegram messages to Paul and view his traffic in real time. To prove that the competition was fair, we will publish the participating keys necessary to decrypt the traffic as soon as a winner is announced. In case there is no winner by March 1, 2014, encryption keys will be published at that date. Got questions about this contest? Check out the Contest FAQ! All applications support phones and tablets, including no-wifi devices.